Shortly after age 50, the rate at which a person loses muscle mass begins to accelerate. Age-related muscle loss is referred to as sarcopenia, which is Greek for “poverty of flesh.” Unfortunately, the prevalence of sarcopenia is increasing with each generation; the number of elderly individuals who are frail is expected to double within the next 40 years. One theory for the growing prevalence of sarcopenia posits that the genes responsible for repairing damaged muscles were programmed during the late Paleolithic period when constant activity led to continual repair and remodeling of muscles. Our current, more sedentary lifestyle does not match our evolutionarily programmed Paleolithic genes. Supporting the belief that human genes were designed for activity is the fact that modern hunter-gatherers develop sarcopenia at much slower rates than similar-aged sedentary populations. While research confirms that regular exercise can reduce the speed of muscle wasting, there is a surprising amount of controversy regarding what type of exercise is best-suited for maintaining muscle mass. According to the American College of Sports Medicine, the only way to effectively build muscle is to perform multiple sets of 8 to 12 repetitions using heavyweights. The theory is that the muscle must be pushed to the limit of its capacity to stimulate muscle repair. The problem with using heavy weights is that as a person ages and muscle fibers begin to disappear, the vanishing muscle fibers are replaced with fat and scar tissue, which significantly weakens muscles and tendons. 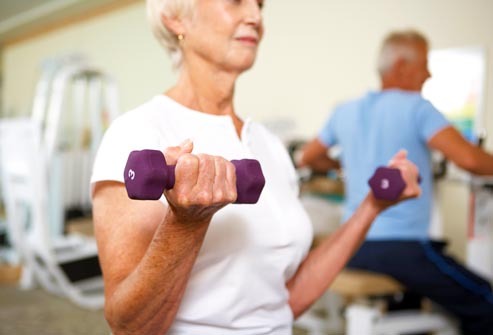 As a result, heavy resistance exercise increases the likelihood of a muscle tear, which explains why so few seniors are consistent with strength-training programs. Fortunately, recent research has proven this theory wrong: exercising with light weights, when done properly, is very effective at stimulating muscle repair. To understand how light weights can increase muscle remodeling, it is first necessary to understand how muscles work. Basically, all muscles are made of small cells, or myofibers, which are classified as either slow-twitch (type I) or fast-twitch (type IIB) fibers. Slow-twitch fibers are designed to produce low levels of force for long periods of time. Slow-twitch muscles use oxygen for energy and therefore require a lot of capillaries to supply them with oxygen-rich blood. Slow-twitch muscle fibers are the body’s preferred fibers when running marathons. Conversely, fast-twitch fibers function without oxygen and produce large amounts of force in very short periods of time. Fast-twitch muscle fibers are essential for success in sprinting and weightlifting. Because fast-twitch muscle fibers function without oxygen, they have limited need of a blood supply. Fortunately, muscles can be “tricked” into recruiting fast-twitch fibers (and hence, stimulate satellite cell activity) by fatiguing the slow-twitch fibers with multiple sets of light-resistance repetitions performed with very short rest periods. Although the exact mechanism is unclear, it is theorized that frequent repetitions performed without rest causes an increase in intramuscular pressure, which in turn reduces oxygen levels in the muscle. The following routine, which can be applied to any specific muscle group, takes about five minutes to complete and should be performed two to three times per week. Because the body adapts to specific exercise protocols, vary sets and repetitions on 12-week cycles. Some of the sets should be performed quickly and some slowly. Hold some positions isometrically for 5 to 10 seconds. Warm up with one set of 60 repetitions. This will increase muscle pressure and force a shift to fast-twitch muscle fibers. Perform three sets of 24 repetitions to fatigue with less than 30 seconds rest between each set. Perform one 60-second isometric contraction with the muscle held in a stretched position. For a more challenging workout, perform four sets of 80 light-resistance repetitions. This protocol has been proven to strengthen tendons in high-level athletes. The most important factor is to begin strength training early in life because it is not possible to increase the total number of muscle fibers in the body; it is only possible to maintain existing muscle fibers.